Enjoyable, frequently funny comedy with strong, likeable characters, impressive animation and a script that's packed with both terrific gags and subtle movie references for film fans. Reese Witherspoon voices Susan, an ordinary woman who's hit by a meteor on her wedding day and suddenly grows to 50 feet tall. She's immediately captured by the military, led by General W. R. Monger (Kiefer Sutherland), and taken to a secret government facility (i.e. Area 51), where she's renamed Ginormica and locked away with four other monsters: blue, blob-like Bob (Seth Rogen); fish-man Link (Will Arnett); mad scientist Doctor Cockroach (Hugh Laurie) and the enormous Insectosaurus, who actually looks more like a giant mutated hamster. Initially, Susan despairs of ever seeing daylight again, but when galactic overlord Gallaxhar (Rainn Wilson) announces his plan to wipe out humanity (“Humans of Earth, I have come in peace. However, most of you will not survive the next 24 hours”), President Hathaway (Stephen Colbert) decides that the monsters are Earth's only hope against the invading aliens and our five heroes are pressed into action. The character designs are superb, with terrific voice work across the board and each monster drawing their origins from classic sci-fi movies (i.e. The Blob, The Creature From The Black Lagoon, The Fly and Attack of the 50 Foot Woman). In addition, the script crackles with great lines and is packed with both verbal and visual gags, ensuring that there are good laughs in every scene. The animation is extremely well done and there are some stunning action sequences, most notably an attack on Golden Gate Bridge that's as exciting as any live action set-piece. The 3D effects are good too, though nothing quite matches up to the film's brilliant opening shot of an observatory technician playing with a bat and ball-on-a-string. The only problem with the film is that the climax isn't as dramatic or as emotionally satisfying as it should have been (think Toy Story) and the finale could probably have used an extra rewrite. 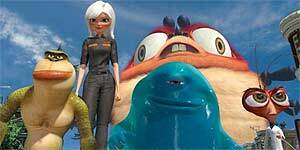 Monsters Vs Aliens is a beautifully made, hugely enjoyable and frequently hilarious animated comedy with delightful characters that make you long for a sequel. Highly recommended.